It is 46 years since the internet was first developed (ARPA network), 21 years since the development of the first web browser (aptly named WorldWideWeb) and fifteen years since the launch of the first recognisable social network (SixDegrees.com). Today half our population actively uses Facebook, and over 60 per cent of Australians use some form of social media. However some in government are still debating whether social media is a valid channel for them to use, or whether it is simply a 'fad'. I gave a presentation yesterday at an OPC Web Xchange event on why agencies should use social media an how they could build their social media infrastructure. 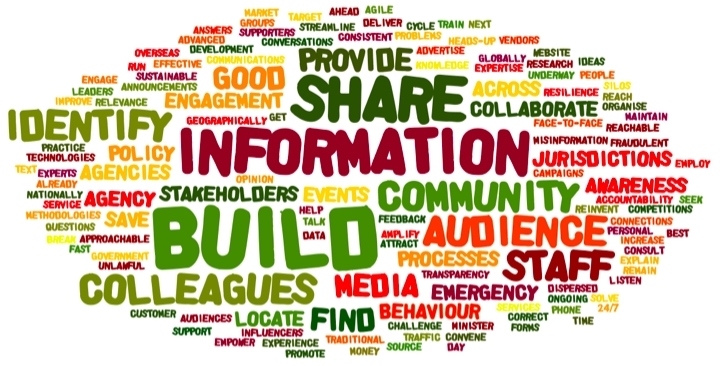 As part of my preparation for the event, in about twenty minutes over the weekend, I brainstormed 63 reasons why government agencies should have a social media presence. Some may not apply to your agency. I may have missed others that do. However in case you're struggling to justify using social media in your agency, here's my 63 reasons to start you off in thinking about which reasons are most important in your situation. Note that they are listed alphabetically, not by importance. And here's a word cloud of the reasons to show the themes that stand out.